The aim of Eurofound's report on NEETs - Young people not in employment, education or training: Characteristics, costs and policy responses in Europe is to investigate the current situation of young people in Europe, focusing specifically on those who are not in employment, education or training, and to understand the economic and social consequences of their disengagement from the labour market and education. Member State initiatives to help reintegrate young people into the labour market are also investigated. Definition: what is a NEET? The term NEET is used to describe young people who are not engaged in any form of employment, education or training. The term has come into the policy debate in recent years due to disproportionate impact of the recession on young people (under 30 years old). The unemployment rate for those under thirty is nearly double the average rate. 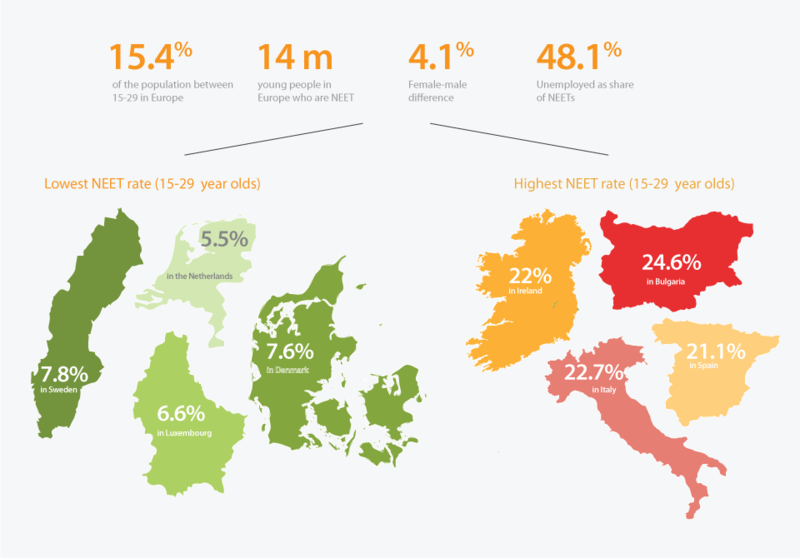 Those with low levels of education are three times more likely to be NEET than those with third-level education. The risk is 70% higher for young people from an immigration background than nationals while having a disability or health issue is also a strong risk factor. In 2011, some 14 million young people under the age of 30 years were not in employment, education or training across the EU as a whole. 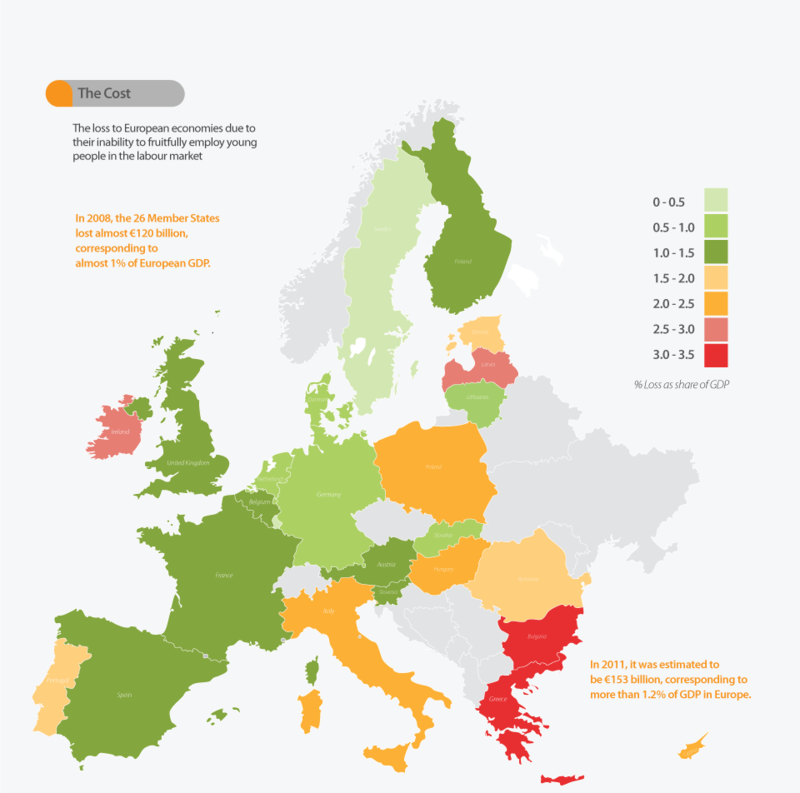 However, rates vary widely from around 5.5% of 15-24 year olds in the Netherlands to 22.7% in Italy. 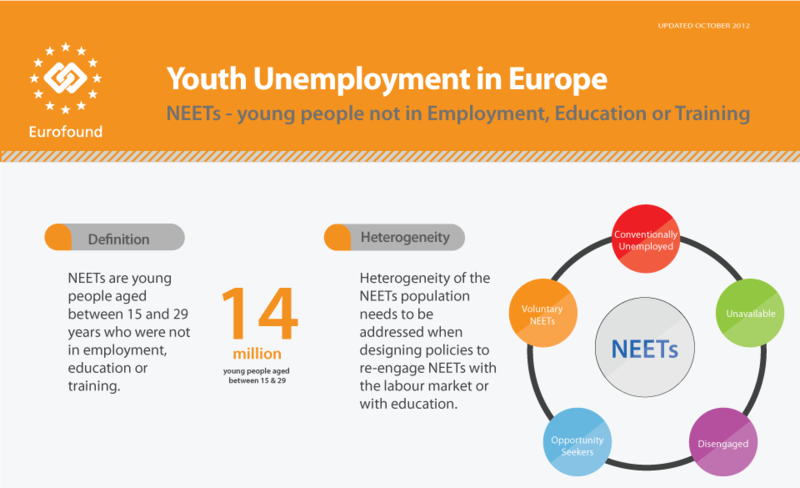 The economic cost of not integrating NEETs is estimated at over €150 billion, or 1.2% of GDP, in 2011 figures. Some countries, such as Bulgaria, Cyprus, Greece, Hungary, Ireland, Italy, Latvia and Poland are paying 2% or more of their GDP. The economic cost is not the only one. Young people not in employment, education or training are at higher risk of being socially and politically alienated. They have a lower level of level of interest and engagement in politics and lower levels of trust. Even in those countries where NEETs are more politically engaged (such as Spain) they do not identify with the main actors. 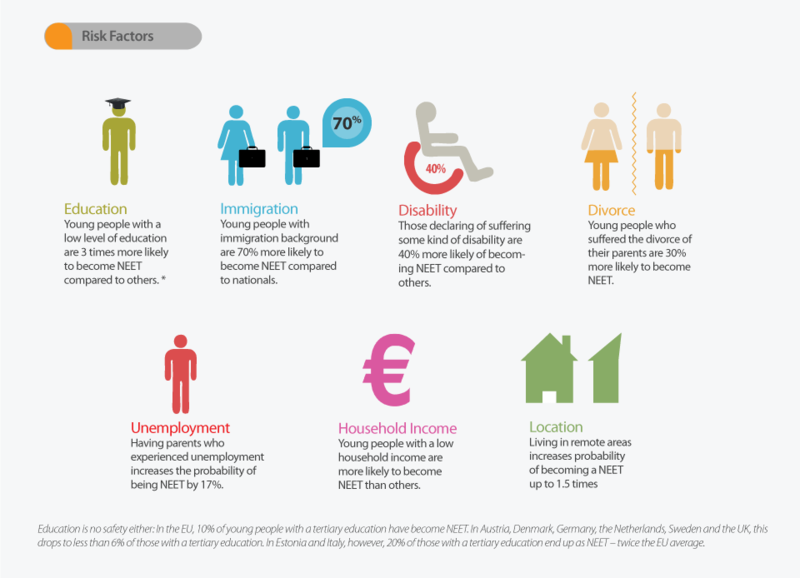 EU Member States have tried a number of measures to prevent young people from becoming NEET and to reintegrate those who are NEETs. The involvement of a range of stakeholders in the design and delivery of youth employment measures is essential. In particular, a strong level of engagement with employers and their representatives is needed for measures that focus on fostering their beneficiaries’ employability. Successful policies are innovative. They introduce new ways of reaching out to their target groups, with outreach activities forming an important part of efforts to engage disfranchised young people, while incentives, ‘branding’ and marketing campaigns can be useful in the context of more universal youth employment services. Foundation Focus - Youth in Europe: best days of their lives?